Its been a long time since I took a vacation with my family and this summer, with my kids being more than 1 & 1/2 years old, I dared to take a short one. My brother in law(Leo) and his wife and their daughter joined my wife and me with the kids. Intention, a long drive for me and a short vacation for all. Destination, Mahabaleshwar. It wasn’t an easy task waking up the kids and getting them ready for the inevitable 300+ km drive to destination. Driving long distances to some place is something most sane people hate, but people like me just love the thought of it. So I was the only one looking forward to the drive. Rest all were “why can’t we just land at mahabaleshwar without this drive or any other mode of travel?” in their mind. Within half an hour all the three kids were ajar from sleep and the eldest one was impatiently asking whether we had already reached. It was futile to tell that the drive was going to last good 6-7 hours since I would then have to explain the concepts of reading time and such stuff. I just kept driving with music on. We had left home at 6:30 am and by 8:00 am or so we had out first halt somewhere near shil phata on thane shil phata road, fueling up the car and filling up our tummies with homemade omelets with sliced bread. With our hunger calm and a resolve to drive through Pune and beyond, we started after this short break. Since this was my first drive to Mahabaleshwar, it was natural that I was misguided by a person at the crucial intersection which would put us on Mumbai Pune expressway. We realised the mistake, thanks google maps and some smart voice guided navigation and an u turn after about a kilometer put us back on the expressway, zipping past the very mild traffic. My heart once skipped a beat when there was a loud bang and sound of air escaping from underneath the car. A quick examination revealed no puncture and I was relieved. Past the expressway and on the Mumbai Pune bypass road(pronounced as Mumbai-Peeoon bypass road by the voice navigation lady which was found amusing by Lynelle) the stomachs started signalling a break. Me and Leo started the lookout for the familier “M” signifying mcdonald which we had encountered once on an all mens trip to Goa via the same road. I had doubts that we had missed it, but again, google maps to the rescue, solved this puzzle and pointed out that it was ahead. About 15 minutes drive from there and the car eased in to the familier parking which we had used some time back on that trip. The pleasant sign of Dominos and Mcdonald, side by side, raised our appetite and our expectations of a good brunch. We all ate, drank and I had a couple of photos in the meantime. We also bumped into my wifes colleague(what a small world) who was on his way to chennai with wife and kid. Whooosss…A drive all the way to Chennai from Mumbai. The thought itself was tiring. Brunch done. No breaks now as Mahabaleshwar beaconed. The drive on Pune Satara road and the Wai Panchgani road was uneventful and we reached our destination by 3.00 pm. I somehow managed to drive the left front wheel of my car in to an open gutter on the narrow Mahabaleshwar market road but we were immediately helped by the locals. The cool comforts of the hotel ensured some good rest on arrival and we were ready to explore some Mahabaleshwar (already explored number of times by us adults) . 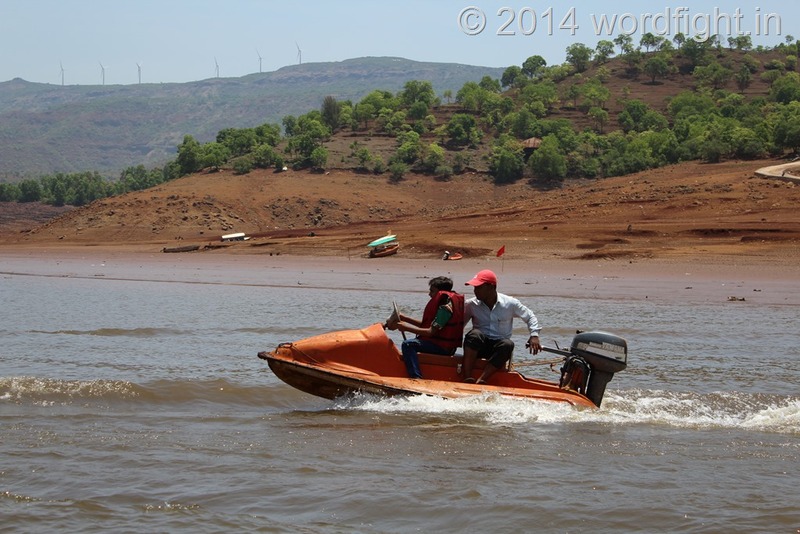 The Venna lake on Panchgani-Mahabaleshwar road was our first stop. With horse rides and boating on offer (Motor, paddle and rowing boats), Venna lake happens to be one place which no tourist skips. The queues for boat ticket are maddening and though I personally don’t fancy them much, but the kids love it and hence we were in a boat before long. Boating concluded, with few more photographs, in about 3 quarters of an hour and we were ready for some “orshe’ ride(Ian, my elder of the twins, calls the horse “orshe”. Very sweet to ears). Ivy, my younger one was more subdued. May be it was the twilight conditions. But she didn’t protest sitting on the horse. Ian, who normally is scared of living animals if taken near, was very ecstatic when he actually sat on the horse. One round of the flatland, 100 rs short on wallet per horse(Leo’s wallet) and the moods heightened, we all clicked few photos and were off the back of the poor but majestic animal. Whatsapp, Sharukh, Saif such were the names of the horses. Lynelle enjoyed some merry-go-round and a train ride before we decided to go back for dinner and subsequent rest. Of course, we had the customary Strawberry/Mulberry/Mango with cream, a dessert never to be skipped in Mahabaleshwar. I was thinking of an early rise and few clicks of the sunrise. The previous days tire got better of me and I woke only by 8, well after the sun beat me to it. An ideal day of outing at Mahabaleshwar covers all the “Points” and Panchgani for Table land point. not for us. Leo mentioned some place called Tapola near by with river sport activities and we decided to drive there. About 23 km from Mahabaleshwar, and a drive down along the ghat leads to Tapola village on the banks of koyna river. The drive on the serpentine road, covered with a canopy of trees leading to the entry to the ghats is a wonderful experience. A halt on the edge of the hills and a few clicks later, we were on our way to some very steep downhill sections. I assumed that with the car loaded to its brim, it would consume more fuel while coming uphill. I eyed the fuel gauge and my heart skipped a beat. We were well past the fuel station along the road and my fuel gauge pointed very close to red line. I shared my fear with Leo and he too got worried. We kept on wishing that we would come across a fuel station at Tapola, else one of us would have to hire a vehicle with an empty can to the fuel station uphill. The very first question to the person at the entrance of Tapola village revealed that we had left the last fuel station way uphill. Neverthless we decided to go for the water sport and then worry about the fuel since the village seemed equipped to satisfy our hungers if we were detained there for long. The river bank is accessible by car but it would require a brave heart to negotiate the very steep slope filled with gravel with an entire family in the car. We parked the car halfway in open sun and walked the road. The water sports turned out to be not much other than a motor boat ride, water scooter ride and paddle boat ride. It was the height of summer and the river has shrunk quite an amount. The motorboat ride itself was pleasant and though there was no wildlife to shoot along the banks of the river, occasional water scooters did attract my camera. And of course there was the photo session on the boat itself. We were informed by the boatswain that the ticketing counter kept stock of fuel and they would sell some for emergency. We were relieved, though we assumed the cost of such fuel would be exorbitant. Much to our astonishment, we had to pay just rs 10. extra per litre and they were reluctant to give more than 2 litres. On persuading, we were given the five litres which we asked for. I later realised that the fuel gauge showing very less, had something to do with the slope of the road. Anyway, why take the risk. We drove back home up the ghat, along the serpentine road covered with the canopy of trees. Along the way we encountered a huge monitor lizard crossing the road. I slowed down, but before the camera could come out of the bag, the lizard was well in to the bushes and on its way in to the jungle. An opportunity missed. Post lunch and rest, the evening was dedicated to shopping by ladies. Chappals, chikki, strawberries, pulps and other items which are readily available in our home town were bought for a premium. The ladies took care of the shopping while I carried Ivy all along, oblivious to the fact that my arm was not designed for that endurance test. After shopping as soon as I put her down, I realised my mistake. I was supposed to drive all the way back with an arm which had started to ache mildly and which was surely going to increase next day morning. Day 2 ended with an ice cream post dinner and packing until 11 pm. On the way up to Mahabaleshwar, I was getting the feel of the car on straight flat roads, on curvy hills up and down the mountains etc. I will living the drive. On the way back post lunch, I was counting kilometers. 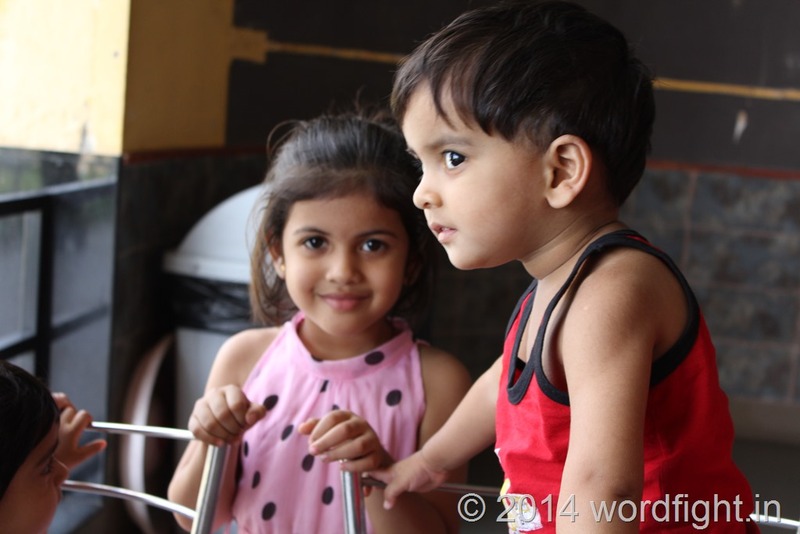 On the third day of our travel, after about 3 breaks and a lot of traffic in Pune and on Mumbai Ahmadabad highway, we managed to reach home at 8.00 in the evening, with and exhausted driver, weary kids and wife and dusty luggage….. I plan to have more such road trips. Though exhausting, it was memorable.